Costume designers, an aspiring opera singer, a cadre of culturally attuned local artists, and neighborhood residents partied at the opening reception for creative grown-up renditions of Goldilocks, Sleeping Beauty, Goodnight Moon, and other favorite childhood stories. Adding more enchantment to the opening was the exhibition curator, photojournalist Michael Cuffe, infamous for creating Obama’s Hopeful Hearts Club art during the 2008 presidential campaign. Inspired excitement fills the monthly openings at Modern Eden Gallery in North Beach. Transformed from a pet store with concrete floors and dark walls, the now sleek, light-filled space houses packed openings and the work of artists, often with penchants for enlightened cultural commentary. Kim Larson, Modern Eden director, and Bradley Platz, gallery curator, opened the space on Greenwich Street where Mason and Columbus converge in August 2014. “I love the Bohemian aspects of the whole neighborhood,” Kim said at the Storybook exhibition opening. 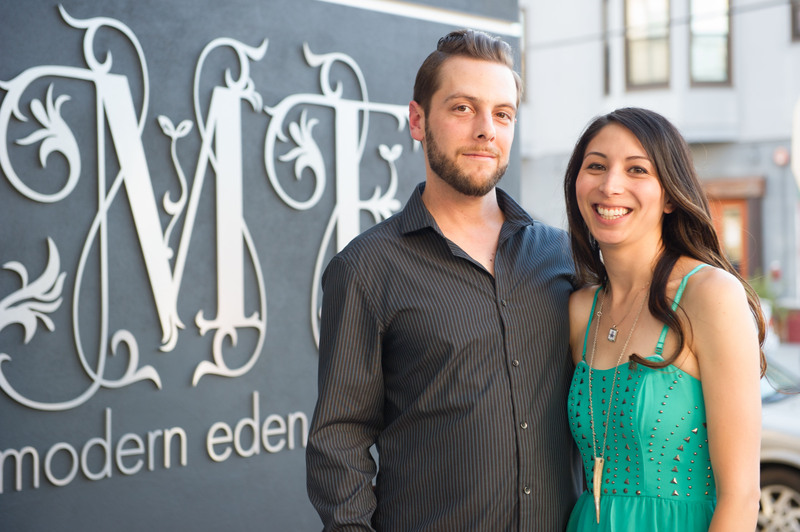 Married to each other, the co-owners, both in their early thirties, opened Modern Eden to showcase not only their own work –- Kim is a jewelry designer, Bradley a fine arts oil painter –- but also the work of a wide circle of artist friends. The gallery name, Modern Eden, signifies the relationship between classical and contemporary art exemplified through Bradley’s personal art and through the gallery’s aesthetic –- from realism to surrealism with a focus on illustrative painting and representational sculpture. A range of vision and style are displayed at Modern Eden. San Francisco artist Leilani Bustamante’s exhibit, Haunt, inspired by Robert W. Chambers’ “The King in Yellow” explores mysteries of the unknown; Amandalynn, a San Francisco muralist, makes portraits of seductive, yet secretive women. Bradley’s painting Sophia (The Birth of the Demiurge) from his Myth and Allegories series presents a breathtaking panorama of skill and storytelling. The gallery logo, a line drawing Bradley created, looks at first glance like a gothic castle on a hill with roots sprouting from a mound of mud. Upon closer reflection, the logo is the San Francisco skyline seen from North Beach dominated by the Pyramid Building and Coit Tower and with roots emerging from the urban skyline. Bradley has lived in North Beach since 2002. He attended San Francisco Art Institute, another neighborhood fixture. The original gallery space opened in 2010 at Powell and Francisco, only five blocks from the new location. And, Kim and Bradley live in North Beach. Encouraging young people to collect art by offering accessibly priced original art and prints is a focus of the gallery owners. “Our clients vary from serious collectors to people off the street, who find a personal connection to a piece of art,” explained Kim. The Storybook prices hovered around $1,000.